ANN ARBOR, MI — The Washtenaw County Health Department has revealed three possible locations where people may have been exposed to measles. Health officials on Monday confirmed Washtenaw County’s first case of measles amid a wider Michigan outbreak. The health department suggests anyone who went to the following locations during the time frames below should monitor themselves for rash with fever or other measles symptoms for 21 days. Jewish Community Center of Greater Ann Arbor, 2935 Birch Hollow Drive on Monday, April 1 to 4 and Monday, April 8 from 7:45 a.m. to 6:30 p.m. This includes families using the daycare program or anyone entering or exiting the facility. Olive Garden Italian Kitchen, 445 Eisenhower Pkwy on Monday, April 1 from 5 p.m. to 7 p.m.
Liberty Athletic Club, 2975 W. Liberty Road on Sunday, April 7 from 1 p.m. to 3:45 p.m. This includes anyone entering and exiting the facility or using the pool or family locker room. Symptoms for the vaccine-preventable disease include: runny nose, red eyes, cough, fever, sore throat, tiny white spots in the mouth, and a raised, red rash that appears on the third to fifth day of illness, according to the health department. The rash starts on the face and spreads down to the arms and legs and lasts four to seven days. Symptoms start seven to 14 days after being exposed and can last one to two weeks. It is spread through through sneezing, coughing or speaking. 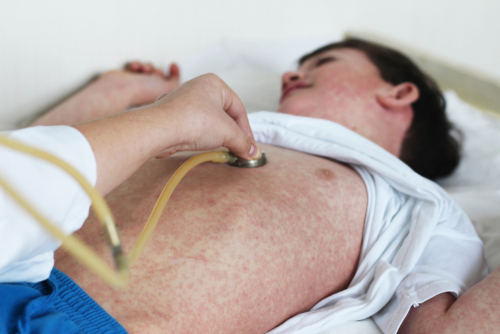 An individual with measles is contagious for four days before and four days after the rash appears, according to the health department. The vaccine, if administered within 72 hours of exposure, can prevent illness, according to the health department. The vaccine is available through primary health care providers and some local pharmacies. The Washtenaw County Health Department is offering the vaccine until 7 p.m. on Tuesday and from 5 p.m. to 7 p.m. on Wednesday.